When we landed we were supposed to be picked up by the tour company. Several of the folks in our group had cars waiting but we had to ask for the assistance of a very kind gentleman in a dark suit. Seems that all of the drivers wear dark suits, thin ties and sharp shoes, looking like Michael Bublé. A bit of a wait later we were in the car and going through Paris traffic, gridlock not unlike any other big city in the morning. The drivers are a bit demented but the bikers absolutely nuts, winding between cars and trucks like they are on a slalom course with a death wish. 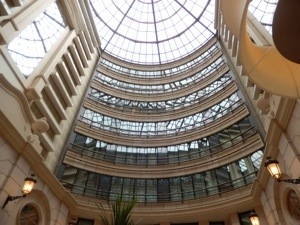 Our first night was at the Marriott on the Champs-Élysées. This gorgeous hotel was the result of many nights in the Shelton Connecticut Courtyard as we saw our son swim nearly every weekend in the fall. Desperate for coffee I ordered some in the lobby. 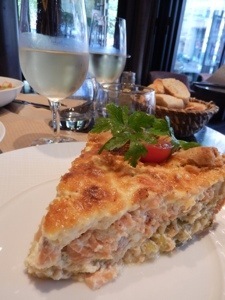 €18 later (yup, Euro, not dollars – welcome to Paris!) I got the necessary jolt of caffeine needed to begin our first stroll toward to Arch de Triumphe. Our friends were to arrive on Thursday so we decided to do some front work and begin exploration. I could spend a month in Paris and still not scratch the surface. We decided to start at the arch and work our way to the Eiffel Tower. The city is made up of lots of traffic circles and spoke streets that link them all. Being so used to the grid that makes up much of Manhattan it was a bit disorienting for a day until the logic of short cuts lit in my head. After that it was a breeze. The circle around the Arch de Triumphe is insane, and the only safe way to get to the monument is through a tunnel. We walked around and looked at the sculpture and inscriptions and honored their war heroes at the tomb of the unknown soldier. 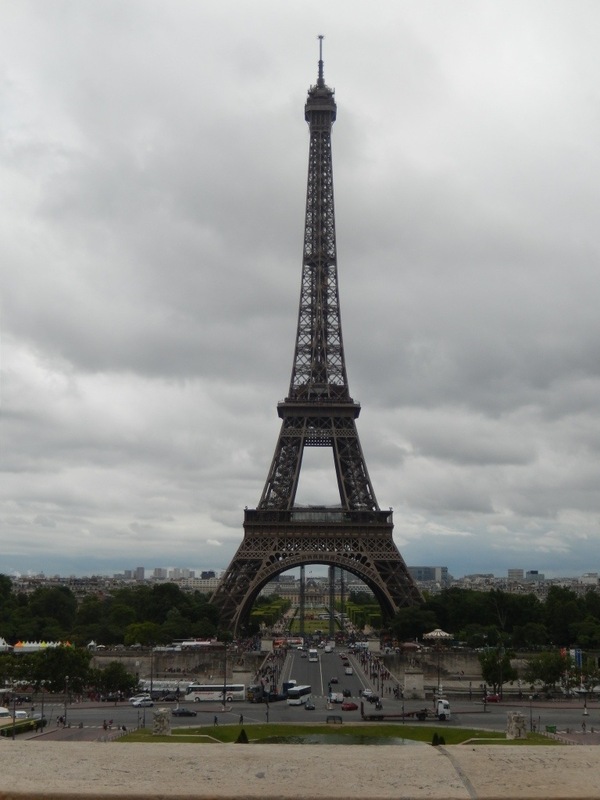 With umbrellas in hand we then walked toward the icon in the Parisian sky. Pick pockets are everywhere and gypsies approach you with ease. Hold on to your stuff and ignore the advances. Don’t worry, they will find another mark. Prior to reaching the tower we stopped at our first cafe, Pub Kléber, sitting with our backs to the building facing the street. How lovely watching the world go by while dining. Very Parisian! We both ordered a dry Chardonnay and I got the quiche of the day. It was a large wedge of happiness, filled with chunks of salmon. I ate a fair amount of it before I realized how light it was. It did not have gobs of cheese, just the right amount to flavor without overpowering the salmon. It went well with the wine, too. After lunch we walked over to the Eiffel Tower. I got a lump in my throat, much like the one I always get when I see Niagara Falls. I hope Parisians get that feeling at least every once in a while. At first I was a little bummed by the weather but seeing this picture of the gray clouds I actually think it looks even more amazing. We were going to leave the tower climbing (by elevator) to when we were with our friends. For now we just stood in awe. We’re in Paris! After checking into the hotel we took a short nap (not recommended but sometimes you have to give into the exhaustion. I set my alarm for 30 minutes and that got me back on track. Our dinner plans and dining companions actually came about a few days before when a dear friend saw my Facebook post about my last minute preparation before the trip. We had not seen each other in months, had not had dinner together in years but met up with each other in Paris for the perfect beginning. 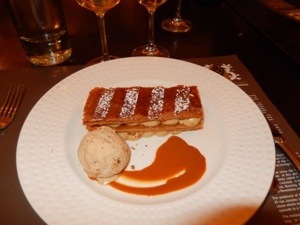 We dined at Le Buisson Ardent, 25 Rue Jussieu, in the Left Bank. 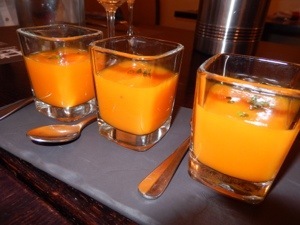 They brought a “shot” of carrot puree which I found just on the edge of sweet. A few at the table did not like the texture so I was lucky to have extra. I came to realize during the trip the French must love juicing vegetables because we were offered this sort of palette opener quite often. 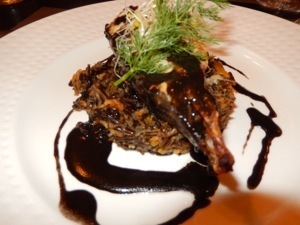 I ordered Turbot rôti au beurre d’oursins, jus corsé à la’encre de seiche et combawa, riz sauvage “mangues, menthe poivrée” which means Turbot (a fish) roasted with sea urchin butter, gravy with squid ink and combawa, wild mango peppermint rice. Tip: when you speak to anyone, a smile and French greeting go a long way. Then, ask politely for a table and most places will give you French menus with English translations. The Turbot was prepared with the bone in so I needed to take a few careful bites before I realized how easy it was to separate the fish from the frame. The squid ink gravy with combawa (a Thai fruit) was a salty contrast to the sea urchin butter. I had never had sea urchin in any way before so I was already able to add a new food to my list. The rice was flavorful but I’m not crazy about crunchy rice so it was not my favorite. 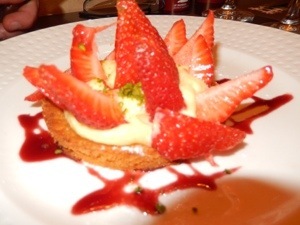 The dish overall was very enjoyable. My dining mates all seemed to enjoy their meals, as well. We ordered dessert in spite of not being hungry for it. 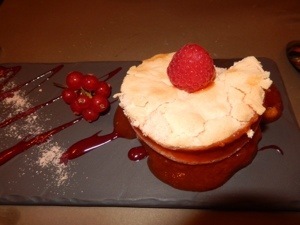 I am very glad we did because each taste was very good. A cab ride back to the hotel, a night cap then a stroll down the Champs-Élysées was the perfect ending to my first day in Paris. Tomorrow: the official Tauck French Waterways tour begins.